Water Bikes By Hydrobike. USA Built. New & Used Hydrobikes For Sale. 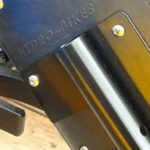 Hydrobikes Shipped Next Day, Direct from Hydrobikes Inc. 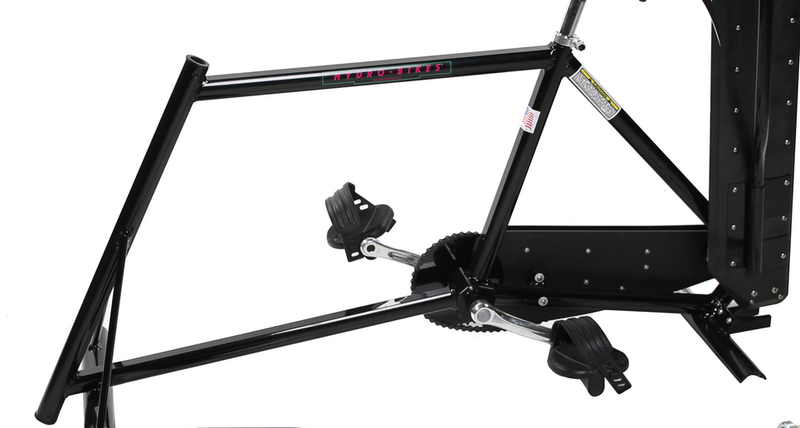 Contact John at 1-888-403-9012, email @ john@hydrobikes.com for best Hydrobike Pricing, Seniors, and Volume Discounts! 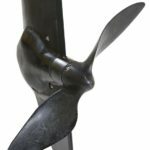 Contact me at the manufacturer’s desk for current best pricing on Hydrobikes, your senior’s discount, to expedite your order, for volume discounts on two or more Hydrobikes, and for parts and technical assistance. 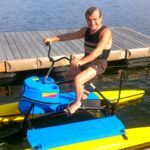 I can also discuss the benefits of a Hydrobike rental business, and offer assistance in getting you approved for operation in your municipality. 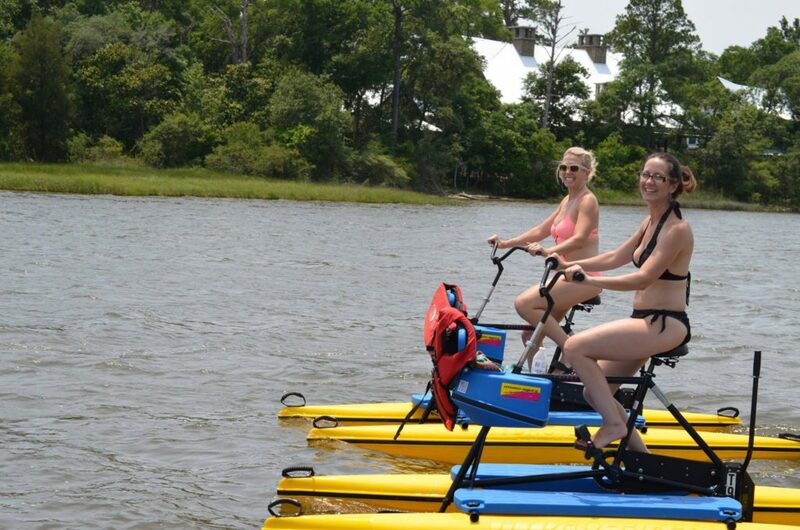 Spring, Summer, & Fall Can Be Much Better With Hydrobikes. Call John at 1-888-403-9012 Today! 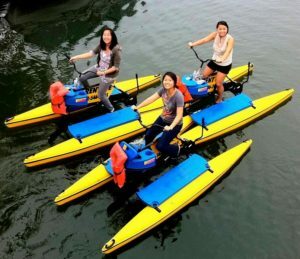 If you’re looking for a very safe and fun water recreation activity water bikes by Hydrobike are a wonderful alternative to cycling on busy streets. 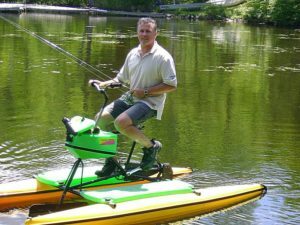 Hydrobikes have become the world’s #1 selling water bike. 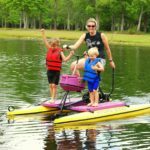 Since 1990, USA built Hydrobikes have become synonymous worldwide with long lasting, premier quality family fun and fitness on the water. 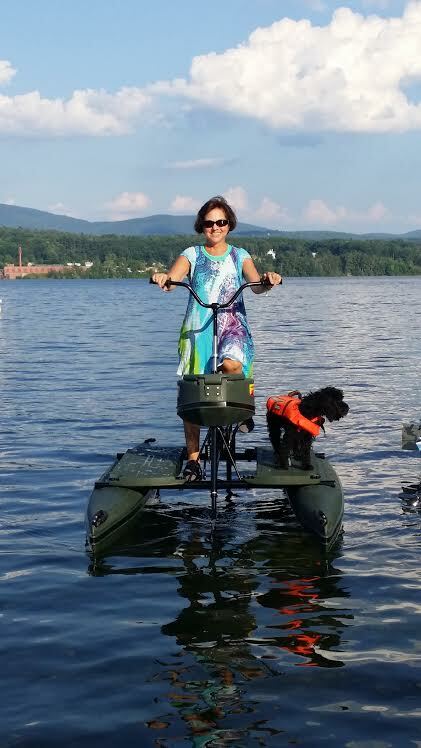 Order today to enjoy Hydrobikes in time for summer. Water bikes by Hydrobike are being enjoyed around the globe. Thousands are benefiting from the fun and fitness aspects of their true biking on water experience with Hydrobikes. This is real off road biking at it’s finest! Hydrobikes are the world’s longest lasting water bike. We know that because we began building them in 1989. 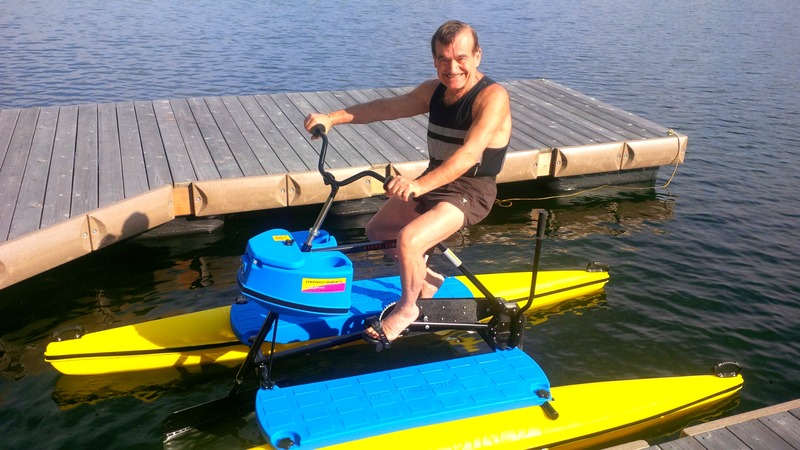 Many original water bikes by Hydrobike are still gracing waterways and providing enjoyment for their original owners. 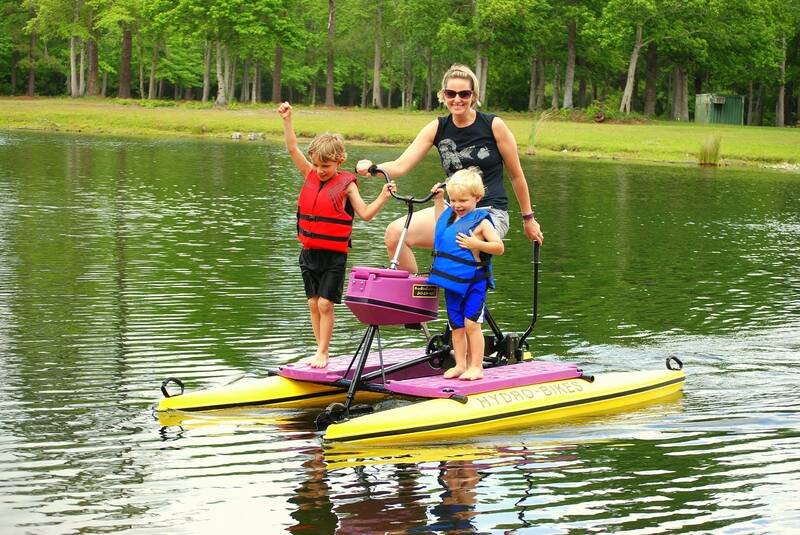 In fact, Hydrobikes often get passed on for the next generation to enjoy! 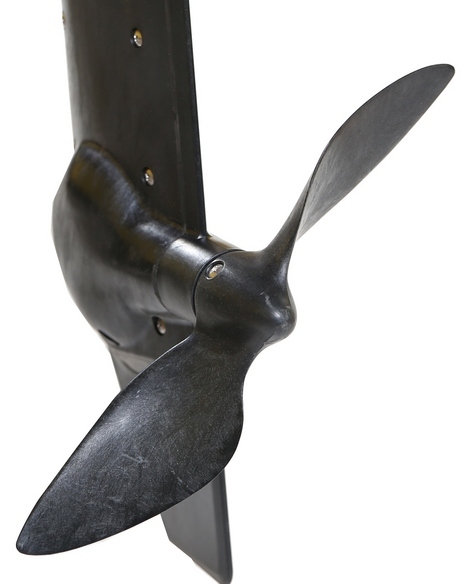 With simple maintenance your Hydrobike will provide many, many years of trouble free enjoyment. Quality is evident in every feature. As a rental unit, Hydrobike reliability means year after year of consistent revenue generation. Beware of other Water Bikes Built ‘Offshore’! Some of these companies even use our pictures to represent their knockoff products and confuse consumers. Their quality is very poor and the drive components are inferior with quick breakdowns. When that happens, there is the serious issue of getting service and parts from companies that get their products or major components from China. That won’t happen with water bikes from Hydrobike Inc. We have been a Minnesota USA based company from the beginning. We now build our Hydrobike water bikes in Iowa. You will never have to worry about service or genuine Hydrobike parts supplies either. We even provide instructions so you can take care of any issues yourself. We make Hydrobike maintenance, service, and repairs easy! To protect yourself in the course of your water bike research, ask these companies where their water bike or it’s components are built. Ask about their history, how long they have been in the business, and about product reliability. You need honest answers before such an important purchase. 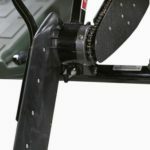 If you are not sure about any of the water bike products out there, ask us! We know the serious water bike world and the competition better than anyone because we started it all. We will give you the straight goods! 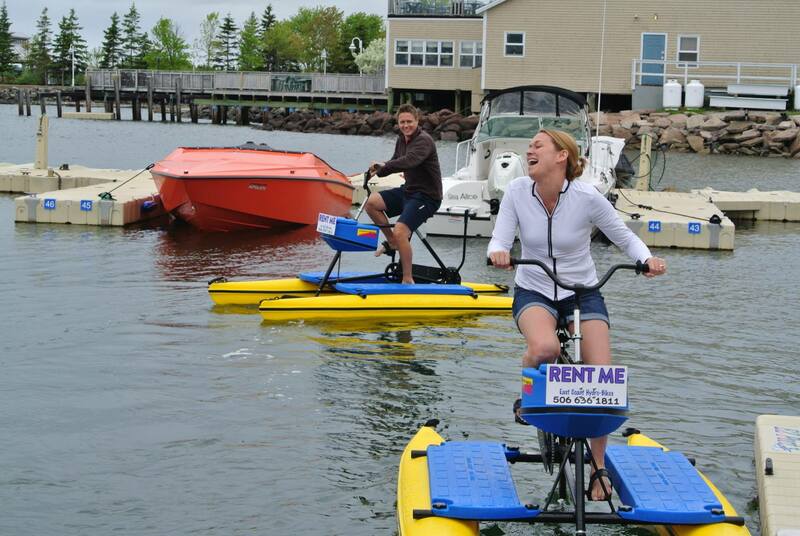 Hydrobike Inc. is the original water bike manufacturer offering water bikes to consumers. Our water bikes are the world’s first and most durable. 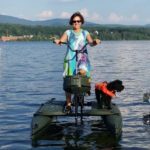 Hydrobikes water bikes are now enjoyed by tens of thousands of water recreation fun and fitness enthusiasts in the US, Canada, Mexico, Europe, South America, Australia, The Tropics, and in 74 countries and counting. Our first water bike was built in 1989. 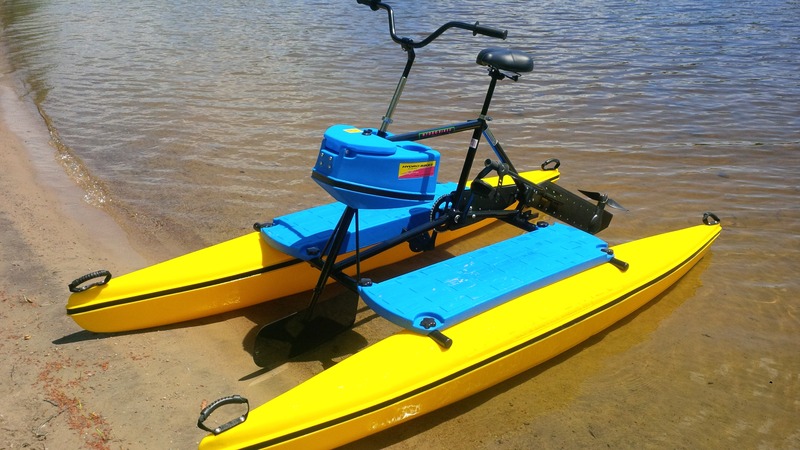 Water bikes by Hydrobike are easy to operate, easy to maintain, and built to last! Everyone from 8-80 enjoys Hydrobikes. Seniors love our water bikes! Customer Comment; My name is Chuck Thomas and I live on Lake Geneva in Wisconsin. I bought a bike from you about 30 years ago and it is still going strong. I have never needed to replace parts of any sort. Very durable! Hydrobikes have always been built commercially tough. Our water bikes are famous for long life. We designed and built our first advanced technology pedal powered drive system a long time ago and have been improving it ever since. 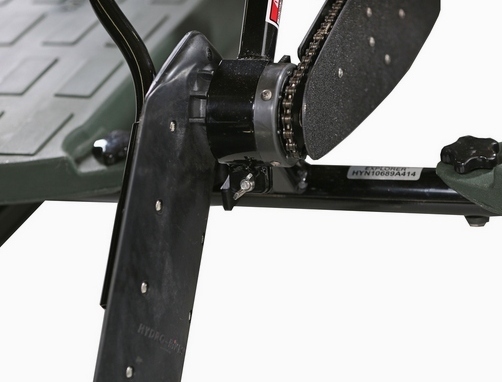 The Hydrobike drivetrain has proven over decades to be the strongest, most durable pedal powered drive system in the industry. 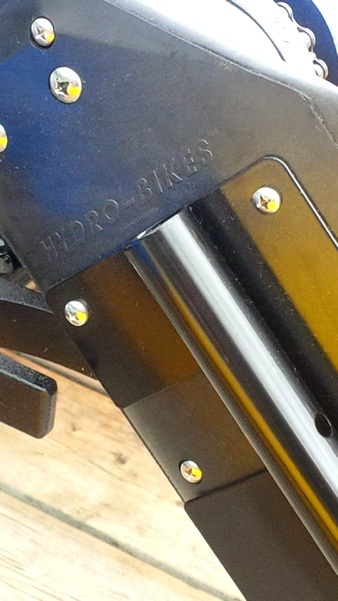 Hydrobike frames are strong, lightweight, and sturdy powder coated aluminum. We don’t believe in building a premier watercraft on inflatable pontoons. The safety of our customers and their families, along with the longevity of our water bikes has been a priority since day one in 1989. Our high density poly rotationally moulded seamless pontoons are unsinkable and virtually indestructible. Warranty: Nothing in this industry compares. In fact, they wouldn’t dare! This is USA built quality at it’s finest. These are numbers we stand by. Hydrobikes have no motor, create no pollution, leave no carbon footprint, and are whisper quiet. In addition, they are easy to ride with no skill required. They are faster than kayaks and better than fishing kayaks for catching fish. You won’t disturb wild, or aquatic life. Our premier quality, water bikes are for family fun, fitness, and your environment. Enjoy a unique, high profit addition to your current rental fleet, or start a unique, proven high profit business. Hydrobike water bikes attract customers and keep them coming back. Our water bikes appeal to riders of all ages. They are the number one choice over kayaks, canoes, and SUP’s. We ship our water bikes direct from our Iowa factory to your door throughout the US, Canada and Internationally. We can refer you to a Hydrobike dealer near you. 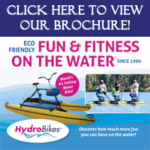 Join our Hydrobike family today! I have worked as an engineer at the Kennedy Space Center in Florida for the past 26 years. 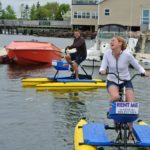 I had been looking for a pedal powered water bike for some time and researched the various models that were commercially available and finally decided on the Hydrobike. It is even better than I had imagined! Whoever designed this water bike thought of every little detail. Everything went together perfectly. I weigh about 235 lbs so I was worried about stability. No problem at all. I can stand on one pontoon and the bike is still completely stable. It is really fast and easy to handle. It was almost effortless. COUPON ENDING SOON! When you buy more than one Hydrobike you save more! Just add more than one Hydrobike to your cart and enter the code BUYMORE to receive $50 off each bike you purchase! Even My Dog Buster Loves It! Call Before 5 pm To Save $50!